Design one or more cards that meet the design constraint described below to win prizes! You may submit up to 3 entries for judging. If you do not declare the 3 entries yourself your first 3 will be judged. In the case of multiple entries, you will still receive one reward at most. In addition to any listed prizes, the 1st place winner then creates a thread for the next round, creates a new design constraint, and the game continues. 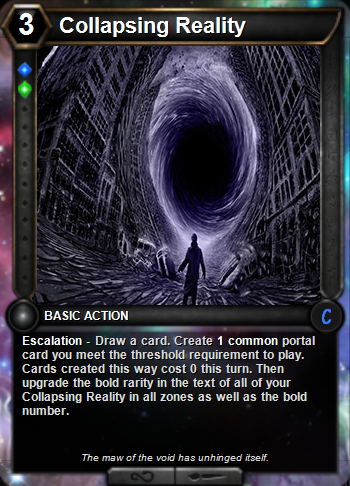 Create a Prismatic Escalation card. it's power level should be around Rare. See the rewards section for examples. for using a certain interaction X times use something like: "Repeat Verdict 1 times. Escalation." 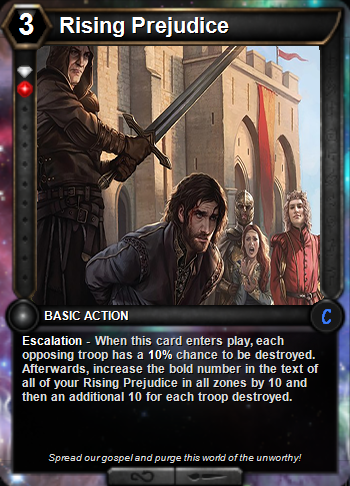 The keyword Escalation means: Increase the bolded number in this card's text by its original value, then put this into your deck. 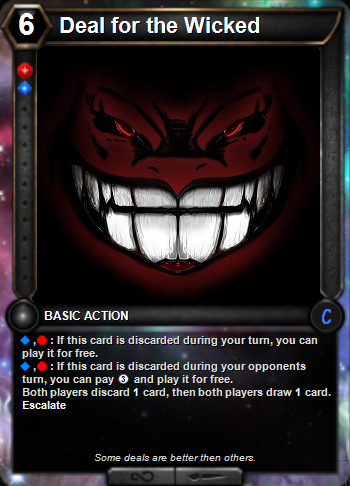 Try to avoid doing things that the shards of the card are not designed for, e.g. ruby sapphire gaining life. The post was edited 1 time, last by SlayerStronghold: Clarification and Update on stretching the rules... ( May 2nd 2018, 2:11am ). Trigger the deathcries of target troop 2 times. Escalation. Create 1 random action with cost X, transform it into a mysterious rune, and put it into play. Escalation. Create 2 spiderling eggs and put them into the opposing champion's deck, then move all banes in the opposing deck up 3 spaces. Escalation. Create 1+X [Where X is the amount of thresholds on this card] random glyph - plus matching glyphs where thresholds are present (Glyph of Duty etc) and put it into your hand. All of your copies of Unstable Signmaking Device gain a random threshold requirement. 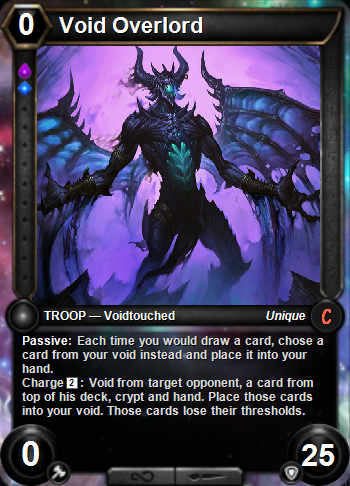 (1) Put this back in your deck - gain a random threshold. All of your copies of Unstable Signmaking Device gain a random threshold requirement. Glyphs of the shards the card doth contain? Would it be, you do not get even one? The post was edited 2 times, last by Karot ( Apr 24th 2018, 11:32am ). Create 1 Valor and play it/them. Put 2 cards from your crypt into your deck. They get "When you play this, draw a card". Escalation. The moon's light graces all. look at the top 1 cards of your deck. put up to 1 of them on the bottom in a random order. summon 1 Blaze Elementals. The card now reads as intended. Destroy each opposing card with cost 1 or less. Escalation. I'm going to enter to contest with 3 cards to show how much I hate the company's desire to get money over making the game good. Gain 1 card pack from each of the last 2 PvP sets when the game ends. Gain 1 random ticket when the game ends. Gain 100 Platinum when the game ends. Hex Card Creator now available! Look at top  cards of your deck and then void any number of them. Reduce the cost of all action cards in your hand by . The post was edited 5 times, last by Lucylumxx ( Apr 28th 2018, 10:46am ). all or your troop with Nulzann in it's name get 1 random gem power. 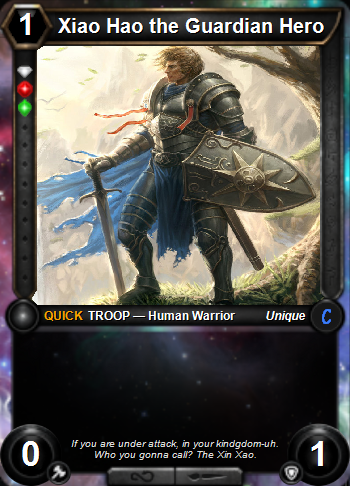 trigger deathcry of 1 target troop you control, and put 1 random troop with deathcry from your crypt into your hand. Create 1 random troop with shifting ability and put iit nto play under your control. Create 1 random troop with inspiring ability and put it into play under your control. Create 1 random shroomkin and put it into play under your control. create 1 random spider egg and shuffle into enemy's deck. create 2 valor and put it in your hand. The post was edited 1 time, last by Qiemosi ( Apr 30th 2018, 12:26pm ). Note: The bold rarity of portals created can reach to the maximum of legendary. Note: The +1 is NOT bold. Note: Only the percentage is bold. - Create 1 Rabid Gnolls. - Troops you control get +1 / +1 this turn. 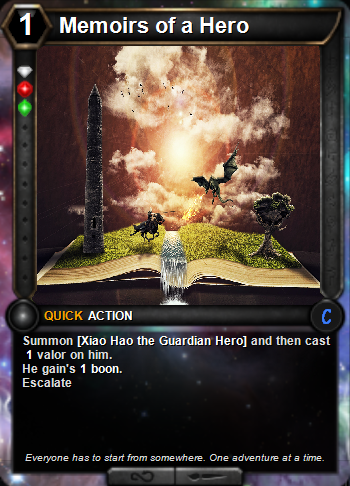 I toyed with the idea of making the card a quick action or making the +1 / +1 permanent... but I decided in favor of the current form so it could clearly be an attack-only aggressive card. Extra points for being fun with surging wildfire, which is one of my favorites. - 1 random card you control that isn't invincible gets invincible. While I initially thought of this an a half-escalation card, in the end I feel like it is fully escalation-y because of the synergy between the two modes. If you're able to accumulate invincible cards, the destroy effect actually gets more powerful, too. 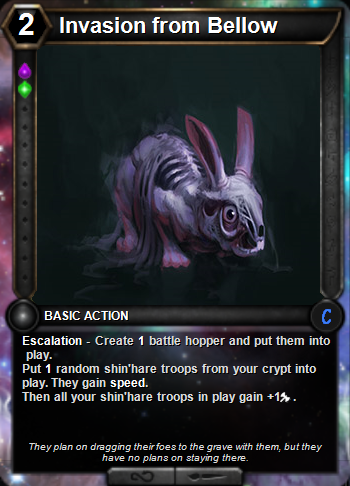 This is a powerful card, but in line with what a rare should do if compared to Light the votives. Don't we all want Wintermoon back? The first and only successful way of using X in an escalate card. Well Done. It's been a while since I last won one! Thanks for hosting the contest, @SlayerStronghold! I'll figure out some contest to host and try to host it. I'm leaving on vacation for two weeks starting tomorrow, but I'll probably be able to access the internet and monitor/judge the contest.